Morgan Stanley Goes Full "Tinfoil": Use Gold As Proxy For The "True Value Of A Dollar"
In a remarkable statement by Morgan Stanley's Michael Wilson, who several weeks ago said that this was it for the market for this year as "January marked the top for sentiment, if not prices, for the year", the chief equity strategist released a report looking at the "great cycle debate" in which he tries to justify his cyclical bearishness by saying he remains a secular bull. While we are calling for a cyclical top in US equity markets this year, we want to be very clear that we also believe we are in the middle of a secular bull market. This is an important distinction because cyclical bear markets that occur within secular bull markets are much less severe affairs. Looking at the last 100 years, we think that it's very clear that there have been three secular bear markets and only two secular bull markets, while we find ourselves in the midst of a third. The dates of the three secular bear markets are 1929-42 (Great Depression), 1967-80 (stagflation) and 2000-11 (secular stagnation). We determine these ranges by looking at the price of the S&P 500 adjusted for inflation and currency depreciation. In other words, what is the real price of the S&P 500 doing. Due to the many criticisms and changing methodologies of the consumer price index as a true measure of inflation, we use the price of gold as a very good proxy of the true value of a dollar over long periods of time. With that one statement, Morgan Stanley is sure to infuriate the "mandarins" at the Federal Reserve, as it confirms that the best indicator of dollar devaluation is not some artificial, "hedonically-adjusted" price index, but the price of gold itself, which also explains why the Fed is so terrified any time "alternative currencies" such as gold, or bitcoin, soar: it telegraphs that the dollar's value, and purchasing power, is crashing. It also explains why central banks had to step in - as the SNB so famously did - in September 2011 when gold had risen above $1900 and was threatening to blow out exponentially, putting the fate of the world's reserve currency in jeopardy. 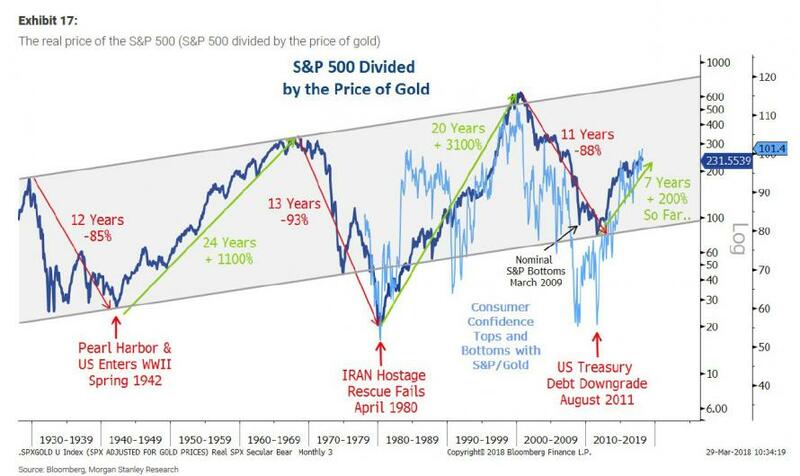 In any case, having decided to use gold instead of CPI as the true indicator of "real" value, or in other words, dividing the price of an asset by the price of gold to show how it has appreciated/depreciated in real terms over long periods of time, Morgan Stanley then uses gold to find the inflation-adjusted value of the S&P. Exhibit 17 shows this relationship for the S&P 500 going back to the 1920s. Without getting into too much detail around the annotations, we think that this chart does an excellent job of illustrating the length and real price damage levied by the three secular bear markets noted above as well as the persistence of the two long and steady secular bull markets from 1942-66 and 1980-2000. We strongly believe that a third secular bull market began in 2011, not 2009. The next cyclical bear market may have already begun with the topping in valuations and sentiment earlier this year, even though we have not yet made the price highs at the index level. We looked at all the cyclical bear markets of the past 100 years, defined as a decline of 20% or more in the nominal price of the S&P 500. From Exhibit 18 , one can see that the worst cyclical bear markets all happened during these secular bear markets while the less damaging ones happened in the secular bull markets. 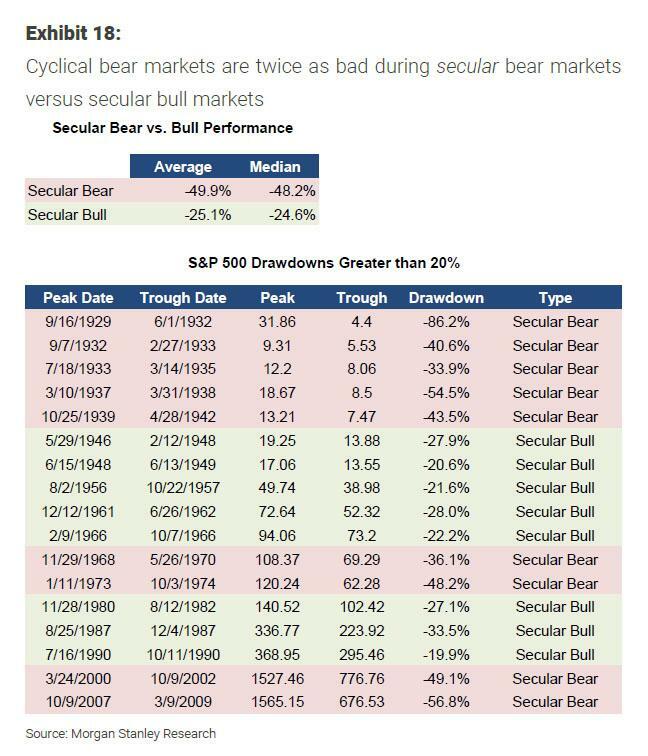 On average, the cyclical bear markets that occurred during secular bull markets were down only 25% whereas cyclical bear markets during secular bear markets were down almost 50%, on average. Is Morgan Stanley - the bank which for the past few months has been warning that we are now in the late stages of the business cycle - right? The jury is still out, and in a subsequent article we will show what the implications are if the coming bear market is indeed in the context of a secular bull or, far worse, everything that has happened in the past few decades has been one giant secular bear, whose manifestation however was masked by central banks which inflated not one, not two, but three giant asset bubbles this century to delay the inevitable day of reckoning.